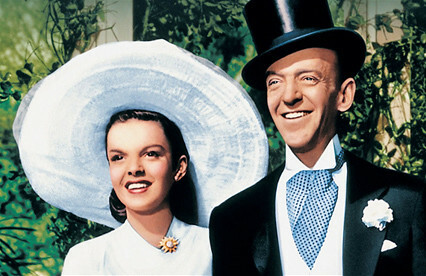 Here's a round-up of my posts on the April movie of the month, Easter Parade (1948), starring Judy Garland and Fred Astaire. -A feature on the making of Easter Parade. -Old Hollywood songs articles about "Easter Parade," "A Couple of Swells," and "Steppin' Out with My Baby." -A feature on Fred Astaire and Ginger Rogers final RKO film, The Story of Vernon and Irene Castle (1939). -A supporting players article on Jules Munshin, who played Headwaiter Francois in Easter Parade. -A look at Judy Garland's Mr. Monotony number, which was cut from Easter Parade.